Lately, both kids have been climbing into our bed at various points through the night, so by the morning all four of us are squeezed in together. 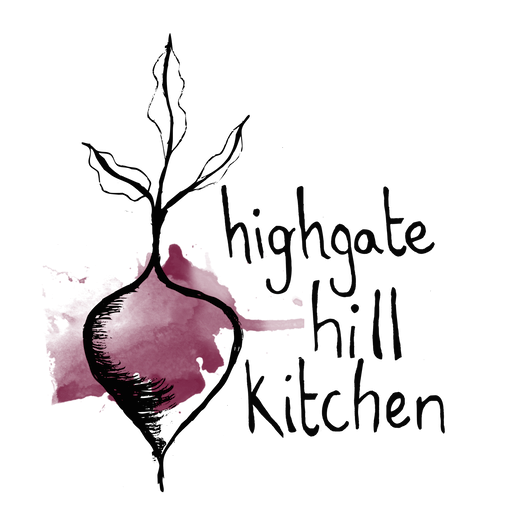 We’re not sure if it’s these cold winter nights that have them seeking extra body warmth, or just that natural childish desire to be close, but either way it is a habit that is equally parts endearing and exasperating (much like parenting more generally, in fact). I’ve been bemoaning the disruptions to sleep, but I also love having their small, warm bodies in the bed. T likes to throw his arm across my neck and tug me close with his chubby, hot hand. W prefers to tuck her head securely under my chin, then stretch out her legs and warm her feet on S’s belly. Once they fall into a deep sleep though, they both loosen up, lying on their backs, arms flung up above their heads, breathing deep and slow. This morning both S and I woke up before the kids, sneaking out of bed and stealing a moment of quiet in the kitchen together, when we heard a sing-song voice floating in from the bedroom. T had also woken up, and was cuddling W and singing to her (she was desperately trying to keep on sleeping!). Moments of such sweetness amidst the chaos. All this is a roundabout way of saying I woke up early this morning, before 6am, which is hardly a decent hour in the middle of winter. 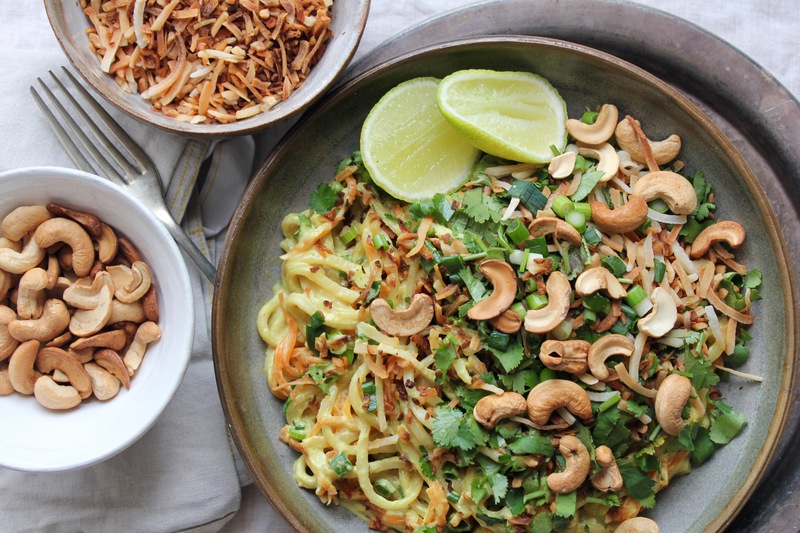 And so I’m tired, with a long to-do list, but I decided that what I really needed to do was to take an hour off in the middle of the day to cook, photograph, and eat this noodle dish that has been percolating in the back of my mind for about six months. It was most definitely worth it! 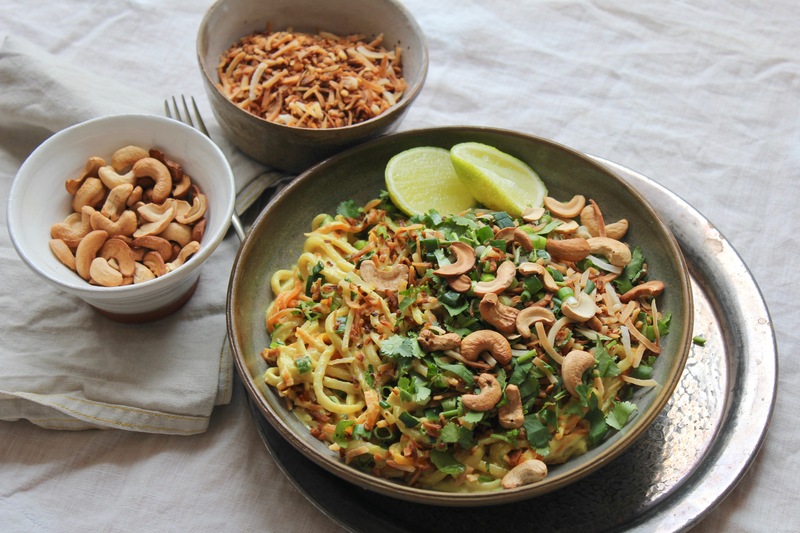 These Coconut Turmeric Noodles are bright and zesty, the rich umami-streaked sauce punctuated by the brightness of the coriander and the spring onion, the toasted crunch of coconut and cashew. A most welcome ray of sunshine on a cold winter day. 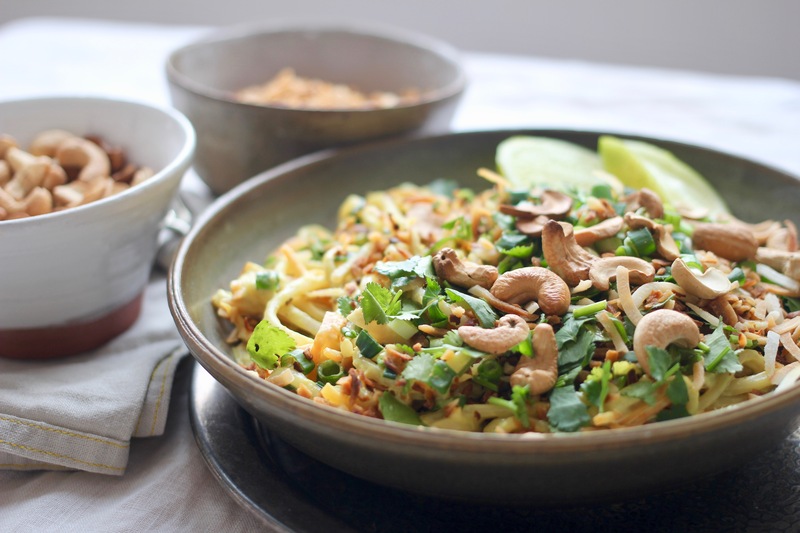 This dish is lovely warm, but will just as easily stand up cold the next day. 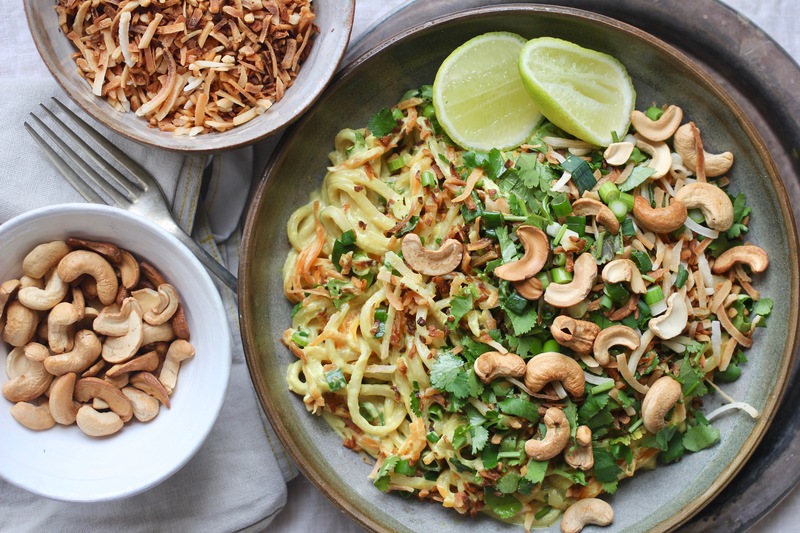 Feel free to play around with the toppings, too – swap out the cashews for peanuts, add some basil or Vietnamese mint, top with thin strips of fried tofu, or even a runny egg. Using a mandoline (or a steady hand and a sharp knife), slice the carrots into noodle-sized batons. Dry toast the shredded coconut in a pan over a medium-high heat, tossing continually for approx. 3 – 4 minutes, or until the coconut is nicely browned. Remove from the heat immediately. Roughly chop the coriander, the spring onion and the pickled ginger. Set aside. Cook the noodles according to the instructions on the packet. When the noodles are almost done, throw in the sliced carrots and cook for a further minute or two. Drain. While the noodles are cooking, prepare the sauce in a pan big enough to hold the cooked noodles. 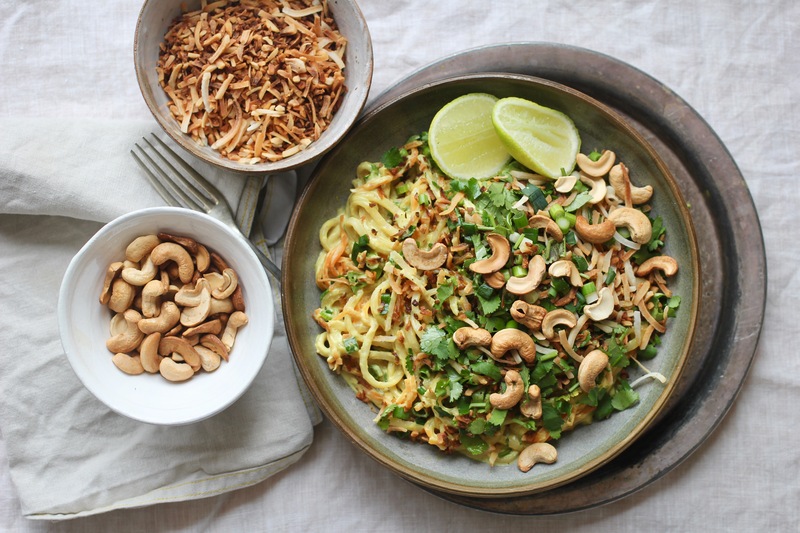 Over a low heat combine the coconut cream, the miso, the ground turmeric & coriander, the lime zest and the syrup. Continue to cook over a low heat until everything is fully combined, adding a splash or two more coconut cream if the sauce feels too thick. 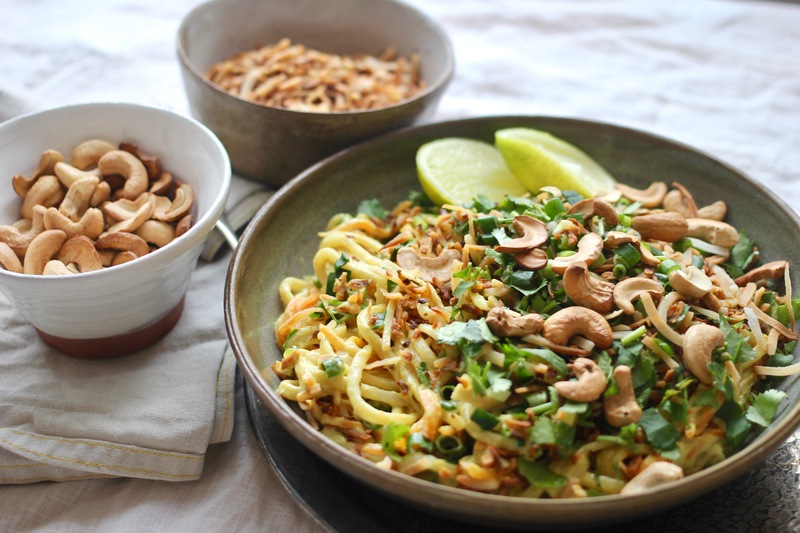 When the noodles are fully drained, toss them into the sauce over a low heat and mix until the noodles are fully coated, just a minute or two. 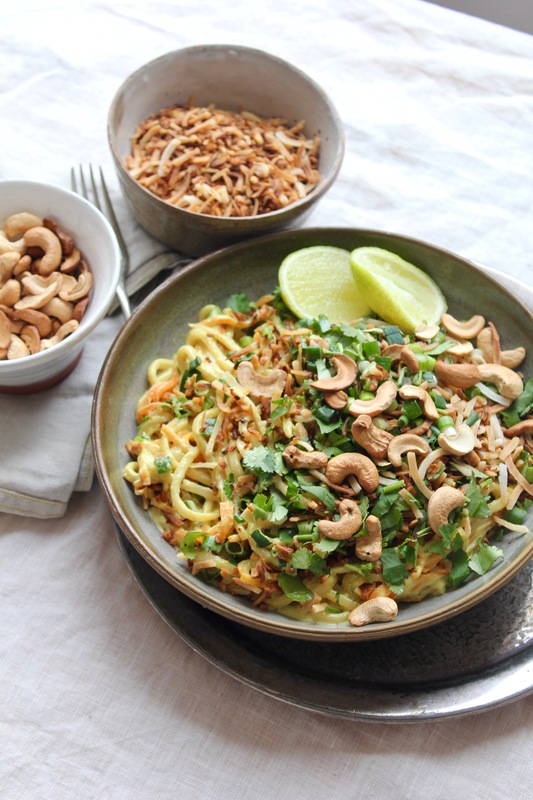 Divide the noodles between the two bowls and top with the pickled ginger, spring onion, coriander, toasted coconut and the roasted cashews, to taste. Squeeze the lime generously over the whole lot, and enjoy immediately! 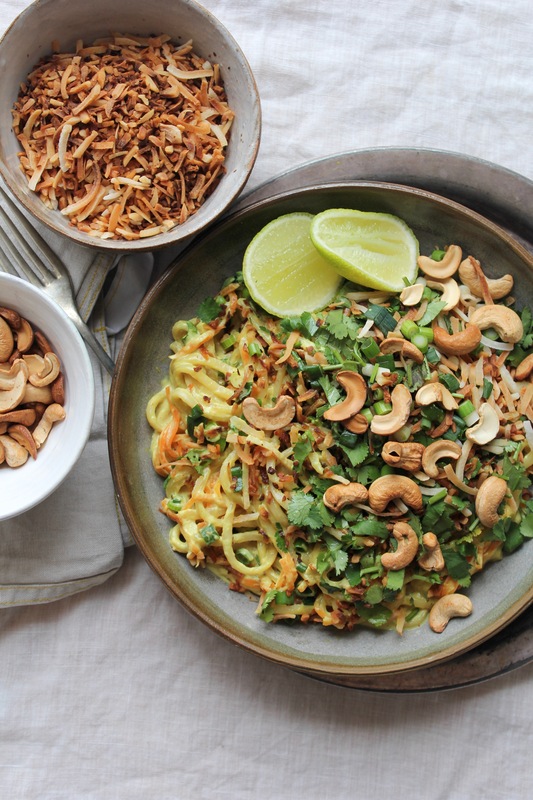 Oh yes, I’m definitely making these noodles when I return from holiday! The flavor combo alone seems worth it. Bet this would be great with some smoky tempeh on top as well. Thanks for making me excited to get back in the kitchen when I get home! 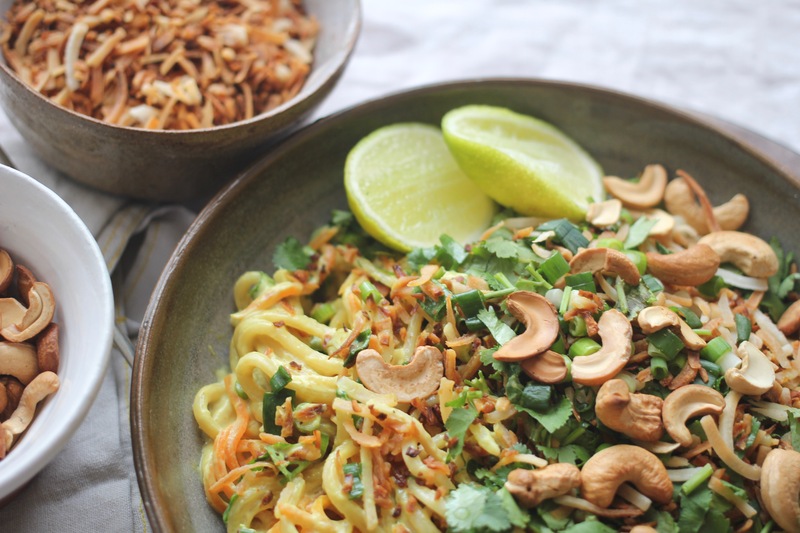 I made these noodles last week, complete with the pickled ginger, and they were delicious! Ended up adding broccoli to cook with the noodles. Will keep this one in rotation!